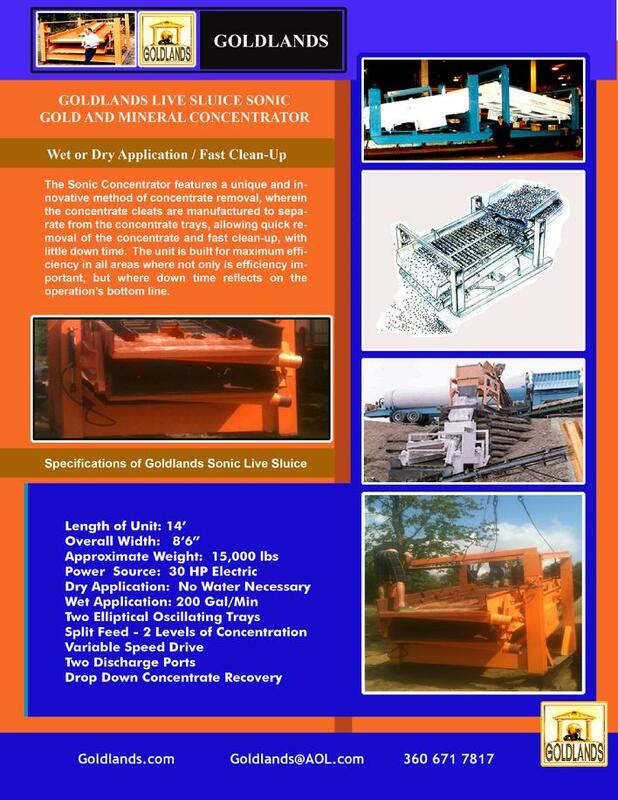 The Goldlands Sonic Concentrator (referred to as the Live Sluice) uses a high sonic oscillating handling method, regulated by a variable speed drive, whereby the dense precious metals and/or diamonds vibrate across hundreds of feet of Quanda trap angle shafts and innovative Eddy rifings. The high oscillating action of the double decked concentration trays, deflects the forward motion of the material upward, allowing the lighter material to stay on the top of the flow and causing the heavies to rapidly migrate to the lowest points. 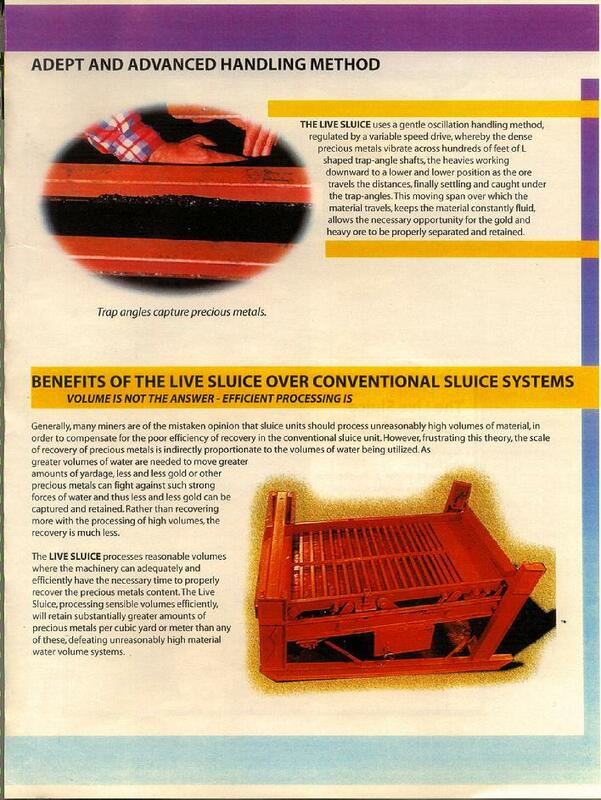 The Sonic Concentrator utilizes a series of innovative riflings, which unique design features causes a vacuum behind each shaft, pulling the dense minerals through the lighter material and removing the values from the upper flow and retaining the higher specific gravity minerals under the riflings. In the Dry Sonic Unit the material is moved along exclusively by the high vibratory sonic action, which keeps the material loose and pulls the heavy values down into the retention area of the machine. When water is used to wash and loosen the processed material and remembering that the water is not the major force rather the ore is driven through the system via the forward vibratory action of the machine, the values are retained at a much greater degree of efficiency. MULTI-DECKS: Increased efficiency The process material can be split into two sizes, each separately processed over one of the two vibrating decks, which increases recovery ratios significantly. Conventional concentration mining systems, especially sluice systems, utilizing huge volumes of water, cannot logically recover any great percentages of gold. Gold, being of such high density, when put into motion, it's extremely difficult to slow down, let alone to stop and capture. Simple physics states that once the heavy or dense body is put into movement its kinetic energy, once in motion, acts to keep the body moving. The tremendous force of water which is employed in most conventional sluices, gives any gold traveling through such great velocity whichm when combined with gold's great mass, causes the majority of gold particles to accelerate and travel right out the end of the unit. There have been many cases where large nuggets have been found amongst the discarded tailings of regular sluice units even after traveling many feet over conventional rifles. 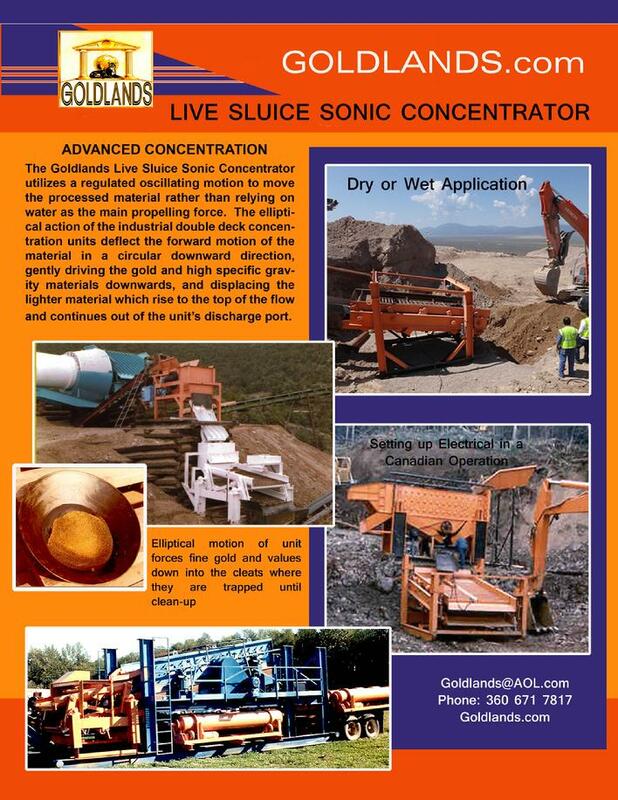 The Sonic Gold Concentrator processes its volumes wherein the unit can adequately and efficiently recover the precious metals concentrate as water is not the tool needed to move the material along. The Sonic Concentrator, using comparatively less water, will retain substantially greater amounts of precious metals per cubic volume than units utilizing water as their means of processing and concentration. The innovative rifles further retain greater values.